Military-connected students — about 1.3 million of them in the United States — face a host of problems their civilian peers don’t. They move six to nine times in the course of their K-12 careers, forcing them to deal with everything from different GPA calculations and course offerings to missed opportunities to try out for sports teams or the school play if, for instance, their family is transferred mid-year. They’re also at the mercy of whatever public school system is near where their parents are stationed, sometimes not of the best quality or well-situated to support the unique needs of military-connected students. Other options, from charters to private schools, can be scarce in the rural areas where many bases are located. One lawmaker, Rep. Jim Banks, an Indiana Republican and Navy reservist who served in Afghanistan, in March introduced a bill he says could help those military-connected students, by providing them with education savings accounts. The money could be used for a variety of educational expenses, including private school tuition, college coursework, or private tutoring. “What better place to [expand school choice] than servicing a unique population of military families, men and women who raise their right hand to serve our country, who make tremendous sacrifices, who the last thing as a country that we want them to be worried about is a good education of their children. That should be automatic,” Banks told a group of reporters earlier this year. Banks proposes paying for the education savings accounts with Impact Aid, the 60-year-old, $1.4 billion federal program aimed at helping local schools educate “federally-connected” children, like Native Americans or students whose parents are in the military, and those who live on federally-owned land exempt from the property taxes that make up the majority of most district funding. And that, other advocates say, is where the real trouble comes in. “We think that the federal Impact Aid system in process is working …To make Impact Aid the bill-payer, we think, our organization thinks, that you’re going to break something by doing that,” John Ballantyne, senior vice president and COO of the Military Child Education Commission, told The 74. The coalition supports school choice and giving military families a wide variety of options, Ballantyne said, it just shouldn’t be paid for with Impact Aid. David Lusk, a former Green Beret, backs the bill, saying it would have helped his family. He’s one of more than 2,000 current and former military members, organized by the Heritage Foundation, who wrote to Congress supporting the school choice measure. Lusk’s daughters Natalie, 15, and Breanna, 20, each attended several schools near Ft. Bragg, North Carolina, none of which served them well, he told The 74. Overall, “it just seemed like everything was more of a day care,” Lusk said, citing discipline problems with other students and a lack of challenging courses. Under the Banks bill, any child whose parent is in the military would be eligible. Families would get either $4,500 or $2,500 a year per child, depending on where they live. Nebraska Sen. Ben Sasse has introduced a similar bill in the Senate. The Heritage Foundation, the conservative think tank which holds considerable sway with the Trump administration, is pushing to include the proposal in this year’s defense authorization bill through its lobbying arm. The legislation, one of the few must-pass legislative vehicles remaining on Congress’s calendar this year, deals with everything from troop pay to the number of new planes and submarines the military can purchase. Subcommittees of the House Armed Services Committee will consider portions of the defense authorization bill April 25, with the full committee set to take it up May 9. There are strategic advantages to attaching the proposal to the defense authorization bill, though the standalone bill has been referred to the Education and the Workforce Committee. Banks’s office said last week he is “exploring various legislative options to advance” the legislation. All Democratic members of the Education and Armed Services committees wrote to the Republican committee chairmen Tuesday to express their “strong opposition” to including the proposal in the defense authorization. President Donald Trump and Education Secretary Betsy DeVos have advocated for more school choice, but so far the only new federal program created under their watch was an expansion of 529 tax-advantaged college savings plans to K-12 private school tuition. DeVos has come out in favor of giving ESAs to military families but hasn’t weighed in specifically on the Banks bill and, according to Politico, it was not discussed during a meeting this week between DeVos and Defense Department officials. Multiple school choice groups, including the DeVos-founded American Federation for Children, have signed on, arguing it could help with military recruitment and retention. Without other options, Lusk, the Green Beret, said his family eventually decided to disperse. He would continue to move as he was assigned, while his wife and children settled permanently in a suburb of Charlotte, North Carolina. The schools there are excellent, he said. Natalie attended a magnet middle school and is wrapping up her freshman year at a top high school that offers personalized learning options and a STEM-focused curriculum, key to helping her pursue her dreams of becoming a trauma surgeon. “I’m very fortunate in how things ended up. It was just one of those things where my wife and I made a decision as parents to make a little bit of heartache on ourselves, but at the same time, it was to benefit our kids,” he said. The proposal also passes several key political and legal tests. Education savings accounts are currently the private school choice program du jour, because they offer a wide array of choices for families and have overcome church-state separation concerns in state courts. There are ESA programs in five states, including Arizona, where students of active duty military members are eligible. In Arizona, the ESAs are funded by state education dollars. A move to make all students in the state eligible has met with strong resistance and has been put on hold pending the outcome of a November voter referendum. Connecting the program to the military, a purely federal responsibility, also overcomes concerns among some conservative Republicans, including those at Heritage, that there should be no federal intrusion in K-12 education. On the other side, progressive and some civil rights groups oppose education savings accounts on philosophical grounds, believing that public funds shouldn’t be used for private, often religious, schools that are not subject to the same accountability and non-discrimination standards. Impact Aid-connected schools and the Military Coalition, a consortium of active duty and veterans’ groups, have written to Congress arguing against using Impact Aid to pay for them. “It is counterproductive to defund Impact Aid, a successful program that has long enjoyed bipartisan support, in order to provide a benefit of questionable value to a minority of military students,” the Military Coalition groups wrote. The Impact Aid program has important backers on Capitol Hill, including GOP Rep. Tom Cole, chairman of the subcommittee that oversees Education Department funding. His Oklahoma district contains both an Air Force base and an Army post and he criticized DeVos at a hearing this year over a Trump administration proposal to cut some Impact Aid funding. 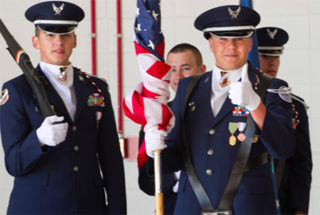 At Knob Noster School District in central Missouri, about two-thirds of the students are military-connected, to the nearby Whiteman Air Force Base, Superintendent Jerrod Wheeler told The 74. It’s one of 30 “heavily impacted” districts across the country where students would be eligible for the higher ESA allocation. About 30 percent of the district’s $17 million budget next year will come from Impact Aid, he said. Losing military-connected students would mean losing not only their Impact Aid, but also their state per-pupil funding. Many military families don’t buy property or change voter registration every time they move, so can’t be counted on to approve or fund increases in local taxes to pay for a loss of federal dollars that benefit their children, Wheeler explained. At the same time, it would be a hard sell to convince local taxpayers, who would be on the hook for even higher bills given the small tax base, to pay more in property taxes to backfill lost revenue, he said. “Our local voters would have to go in three-to-one on [paying] their local property taxes to make up for that,” he said. There are five line items within the broader Impact Aid program; Banks’s bill proposes paying for the education savings accounts from the “basic aid” bucket, the largest of the five. Every school district with eligible students — those connected to the military, Native Americans, children in low-income housing and children of certain federal employees — receives funding from that same stream, with so-called “heavily impacted” districts, like Knob Noster, getting more. So taking funding for education savings accounts for some military-connected kids could mean less funding for other military-connected kids, along with Native American children and the others whose schools benefit from Impact Aid. “The way we interpret the bill is that the dollars that would be drained from the program for families that opted to take an ESA would come directly at the expense of all the school districts in the program that are sharing in that pot of funding,” Jocelyn Bissonnette, director of government relations at the National Association of Federally Impacted Schools, told The 74. The purpose of Impact Aid is to support the education of military-connected students, and the program will help achieve that mission by giving families the freedom to tailor children’s education in a way that best fits their needs, a spokesperson for Banks said in an email. His office has also argued that the proposed education savings account funding, particularly the $2,500 that would go to children whose families live on base in non-heavily-impacted districts, is actually less than the district receives in Impact Aid for each child. Each district receives a different amount per student, depending on a number of factors. Advocates in particular note that Banks’s proposal would open up the existing pot of Impact Aid dollars to many children who currently aren’t counted, including very young children, dependent college students, and those already enrolled in private school or homeschooled. The National Association of Federally Impacted Schools calculated the proposal could redirect as much as $450 million from Impact Aid, or 39 percent of current spending, just for those new categories of eligible students, before counting the students currently enrolled in Impact Aid-recipient schools who could use their funds for another school option. The proposal would tie the ESA allocations to inflation, but Congress hasn’t increased Impact Aid funding at the same pace at which the number of eligible children has grown, Bissonnette said. Conservative advocates, for their part, have argued that the proposal wouldn’t be a budget-buster for school districts that educate Impact Aid-recipient children. Research by the Heritage Foundation found that even if 10 percent of students used ESAs in “heavily impacted” districts that educate large numbers of federally connected-students, the districts’ change to Impact Aid funding as a share of total spending would be less than 2 percent. Four heavily impacted districts — the Minot and Grand Forks districts in North Dakota and Ft. Huachuca in Arizona, plus South Dakota’s South Central district, which mostly educates Native American students — would see their budgets change by more than 5 percent, Jonathan Butcher, the study’s author, said. Impact Aid makes up a very small portion of overall education funding, and few eligible students use education savings accounts in states where they already exist, Butcher told The 74. Less than 3 percent of eligible students in Florida, where only special needs students may enroll, use the program, and even fewer, 1.4 percent, use them in Arizona, which serves broader categories of students, including Native Americans and foster care children, according to Butcher’s report. Progressive advocates have argued that one of Heritage’s underlying assumptions, that few families would take advantage of the ESAs, is inaccurate, given that it’s based on state programs that are often limited to specific populations. It also doesn’t consider the loss of state per-pupil funding, they argue. “Over time, yes, the student count will be updated and that money will no longer be generated because that student’s not there, but it doesn’t happen tomorrow,” he said. In the end, Wheeler, the Knob Noster superintendent, said his staff considers its obligation not just to the many military-connected children they serve but to the military itself and the country’s national security. “It’s not best for our military-connected students, and it’s definitely not best for the military readiness of our state and country,” he said.